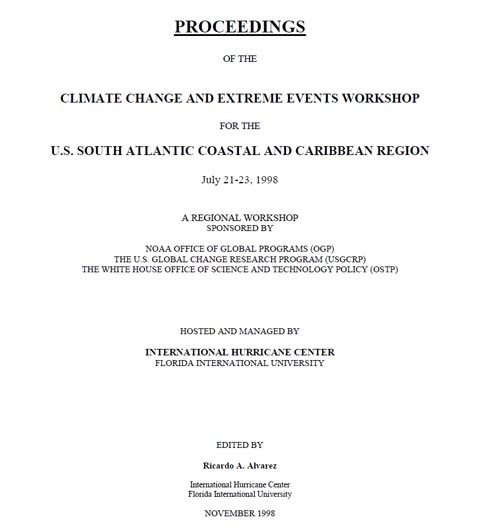 Twelve years ago, in July of 1998, Ricardo Alvarez was Managing Director of the Climate Change and Extreme Events Workshop that focused on the potential consequences of climate change in the region designated as U.S. Coastal South Atlantic and Caribbean. This worksop was one of several regional workshops that were part of the National Assessment (NA) of climate change consequences on The United States mandated by the U.S. Congress. The workshop was sponsored by NOAA’s Office of Global Programs (OGP), the U.S. Global Change Research Program (USGCRP) and the White House Office of Science and Technology Policy (OSTP).